…a shaded portico. A late afternoon sun warmed the rough blocks of stone. “Get out of the way!” someone called. We moved into the yard, squinting at the strong light. One of them sat on a marble bench after I politely pushed some flowers aside. “Did you pick these for me?” she asked, looking me in the eye. I had to tell her the truth. In another part of the grounds someone was singing, but they couldn’t make out the words. In this room, Manson the painter is tucked into a corner — meaning that the real Manson painted (well, inked) himself into a corner, suggesting this expression: “You have painted yourself into a corner.” This is a pretty good expression for this room, since you can’t go forward from here — you have painted yourself into a corner of the Loop. “Paint yourself into a corner” doesn’t mean “go into the corner of something.” It’s about getting yourself into a bad situation you can’t extricate yourself from. It’s not even about forward progress in particular; if you can backtrack then you’re not painted into a corner. Also, is he really in a corner? Also, the fact that he isn’t painted is a bigger issue for this visual pun than you make it. Maybe this metaphor can be shoehorned into Room 7 somehow? It doesn’t work there either but the room has a bunch of paintings and some corners. Or Room 43. Did someone paint “your self” into the corner[s]? Yes, it is a corner. A corner, according to M-W, is “the point where converging lines, edges, or sides meet.” Two sides are enough to make it a corner. I agree that as a metaphor it is not a perfect match, however, neither was “vicious circle,” and that one is Manson-confirmed. If you go through 11 you really have painted yourself into a corner; there is no going back. While Mary Worth is an established source of competent life advice, I don’t believe she is the correct consultant for lexicological inquiries. 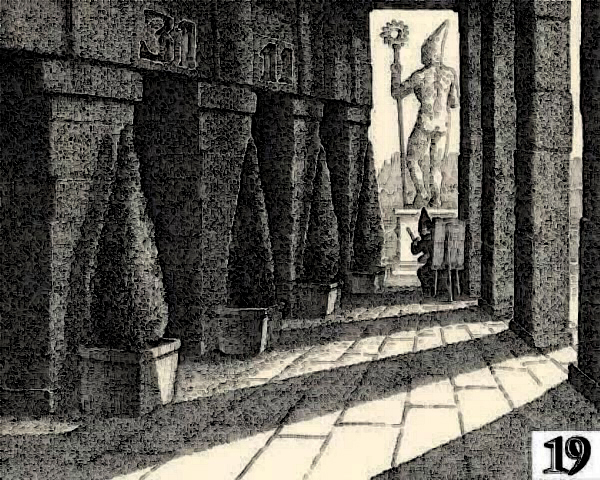 The safe door is closer to the foreground and the Trap door is closer to the background, just as the trustworthy artist is closer to the foreground and the false sun-man is closer to the background. The untrustworthy sun-man is showing us his BACK and is situated on the GROUNDS (this word mentioned in the text). We can hear music but can’t make out the words. This is because it is BACKGROUND music. The trustworthy artist tells us, “Get out of the way!” In golf, you would say “FORE!” to mean the same thing. There are FOUR trees sitting on the GROUND. There are FOUR shadows of pillars on the GROUND. This room is telling you to go BACK TO THE DRAWING BOARD. Because the giant statue has its BACK to the DRAWING BOARD. This is pretty satisfying for a few reasons: the meaning of the saying is that you should give up your current plan/line of inquiry/whatever and just go back to square one. Start again. That’s a perfect message for this room, where you’ve gone as far as you can go without falling into the Trap. Your only alternative is to turn around, and your best course of action is to literally start again by going back to Room 1… where there is in fact another drawing board to go back to! The other nice thing is that it explains the previously confusing “something new” in the text. The route you’ve chosen is wrong; go back to the beginning and try something new. Bravo on the cool sounding phrase generated from the clues. Problem is that’s not a drawing board, it’s an easel. Drawing boards and easels are distinctly as different as storks are from ibises. Also ties in nicely with the fact that the easel/drawing board and artist are giving you 31, so you know the first step to getting back to the drawing board. This room could be telling us to BACK UP. We’ve got the BACK of Manson’s easel, and he is pointing UP with his paintbrush and pointy hat. We also have a statue that is UP on a pedestal, wearing another UPwards-pointing hat, and prominently showing its BACK. The pointy trees also suggest UP. Also, to get someone’s back up is to annoy them or make them angry, which is what the visitors seem to have done to Manson here. The four conical trees could be cluing this reference since they look like the triangles seen on many compass roses. Also, we have “NEW S(o)” in the final sentence (which is otherwise misleading), and NEWS is a common mnemonic for the cardinal directions. Manson takes care to tell us that we are in late afternoon here, so we know for sure that the sunlight streaming in is coming from the west. Therefore, viewers are facing south and the wall with the doors is to the east. If you take a compass that has all letters facing the same way (to be read correctly when N is at the top — this is not always the case — sometimes the letters are rotated) and turn it upside down so that south is pointing in the correct direction, then E will be on the left, but upside-down, so it looks like a 3 — the 3 in 31 on the east side of the picture. W will be on the right, but upside-down, so it looks like an M — M for Manson, and also the M made by his easel legs — and Manson and easel are on the west side of the portico, where the sunlight originates. The sunlight comes from the west and goes east, Manson is “west” and points east towards 31. This is a little convoluted so there may be something better here, but I’m convinced there’s something going on with directions. Also — a compass needle often looks like two elongated triangles stuck together with a circle at the centre — could be what the cones are referencing. There are a lot of cones in this image, and a lot of talk of light and seeing in the text, which really makes me want to do something with cone cells, which are one of the two main types of photoreceptors found in the eye. (The other type is rods, which function best in dim light.) The cones are responsible for colour vision and function best in bright light. This seems pretty good to me as a general reference, but I haven’t been able to do ALL that much with it. The best I’ve come up with so far as a room solution is that humans have three types of cone cells, which respond to different ranges of wavelengths of light: we have trichromatic vision. So THREE types of cones work together to produce a SINGLE full-colour image, which is what we experience. 3 into 1: 31. What makes this slightly more compelling is that the trichromatic theory of vision is quite an old one, several hundred years old, with connections to colour theory and primary colours and the mixing of paints — you see where I am going with this. Just to record/add to recent Tarot discussions that we’ve been having here and on the chat, I wanted to point out that it seems pretty clear that Manson had the Sun card in mind when designing this room. Don’t know that it helps at all with a room-level solution, but it seems fair to suppose that this is another intentional Tarot reference or inspiration. I mean, in many versions of the card, you have the Sun’s rays being depicted as alternating squiggles and lines, perhaps evoking 31, but I know at least one person who would REALLY HATE that idea. Interestingly, but probably coincidentally, there are exactly 11 straight rays depicted on the Rider-Waite Sun card. Three flowers on the left side of the card; one on the right. AND, in a triumph of Googling, I have come across a breed of white horse, the Boulonnais horse, which is also known as the white MARBLE horse and looks passably like the one on the card. There are four tall pillars, four short pillars, four shadows, four bright spots, four bushes. 4 can be split into 3 and 1 but 11 cant. This is another one I really hope I am right about so be nice if Im wrong. Ok. WR path or not – this looks important. I have two paths connected with the guy in 29 saying stuff is important. His staff may be important too beyond the door knob. Look at room 19. The ball at the top of the staff could be the ball breaking the window in 23. The staff itself I don’t recall saying much about. Just the sun at the top. Not sure where this goes but spider sense says…. Hmm. Probably just part of the “look” path. If you see that the ball is a ball and not an eye you can look into it will get you off of a false ” Sun is the guide” thing. Maybe the doorknob itself is important. I am working on an idea which I will post when/if it’s a little more fleshed out. Ooops, shouldn’t have posted that here. Belongs with 29. Nothing really new solutions-wise, but maybe worth observing (which it looks like we almost have but haven’t quite) that this is another case, like in 5 and 30 and 26 for that matter, where a fake thing cannot be trusted. In fact this whole corner of the maze seems to be in part a lesson on shadow and light. In 21 we need to find the balanced path between shadow and light, and take the dappled sign. The white snake indicates the fast router, and the black the slow, and ignoring the Tao completely is disaster. In 44 we find the fountain of youth and rebirth, and in 31 death and pestilence. Here 11 is brightly lit and indicated by sun-man. 31 is partly shaded. 3 dark bushes and one light indicate it. 3 dark easel parts and one bring one indicate it as well. The balanced path indicated by the artist is correct, not the fully sun-lit one. There is more to this lesson in room 3, but I’m not sure if it does more for us than that. The man’s hat points at the statue’s heel. An Achilles heel? Is sun-man’s Achilles heel a lack of balance? Iccarus is certainly famous for an over abunance of sun. Sounds like something I’d joke about, but it looks legit: the four columns on the right are spaced such that the left three overlap, then there is a space, and then a single column: 3 1. Somehow I overlooked this post. I see what you are talking about and I am sold. Adding to the board! Here we have “In another part of the grounds someone was singing”. “so me o new” seems to be the key area to focus on – it is it the text twice and it seems productive for word formation. But there is “one” there or there is “new” so how should we parse? A little later we get help in “something new” because here we can’t find the word “one” in someONE. “so me” is the part want – musical notes. They are the third and 5th note on the scale and a clue to room 35 and Raven. The “so me one” singing is Raven. This gives us more help with 35 being a bird, since all the other “part”s turned up birds, and also helps us strengthen the connection from here to 36 that we should follow for the “riddle of the guide”. The music we might think is coming from 36. It is the only outdoor room which is not part of this group of outdoor rooms. But there is no “singing” mentioned there. Maybe it is bird song, maybe from the bird in 21, or maybe the guide saying “Nevermore”? “They” could not make out the words. But maybe since the guide is a bird, he could. And this would be a hint that the guide is a bird, and that that is important. But I think for the trail of bread crumbs that is the “Riddle of the Guide” we are supposed to head to room 36 and then later to room 21. We got to 19 from room 1 via the list of connections above, and then head to 36. With careful text parsing there and with help from here, we can find that the guide is singing there. There we can see it better is we parse the text. “I…was affected by the sound.” (and “affected” can mean “influenced”) One of the visitors noticed me, listening (to him). “Beautiful music, don’t you think?” (subtle hint that his singing is not). He responds stiffly. Here we note the key word “part”. It seems key to looking at parts of words. In 43 it is part of particular and there are we do is move a plural making “s”. In 16 we can find “egret” buried in the sentence. And in 32 we can find an anagram of Raven, “n a ver”. There are only two other instances of “part” in the text – 19 and 36. All these places are very guide related (36 slightly less so). In 36 the best bird I find is in homophone form. “Turning a corner” right after the “part” give us “turn/tern”. Here we have “In another part of the grounds someone was singing”. “so me o new” seems to be the key area to focus on – it is it the text twice and it seems productive for word formation.. But there is “one” there or there is “new” so how should we parse? A little later we get help in “something new” because here we can’t find the word “one” in someONE. “so me” is the part want – musical notes. They are the third and 5th note on the scale and a clue to room 35 and Raven. The “so me one” singing is Raven. 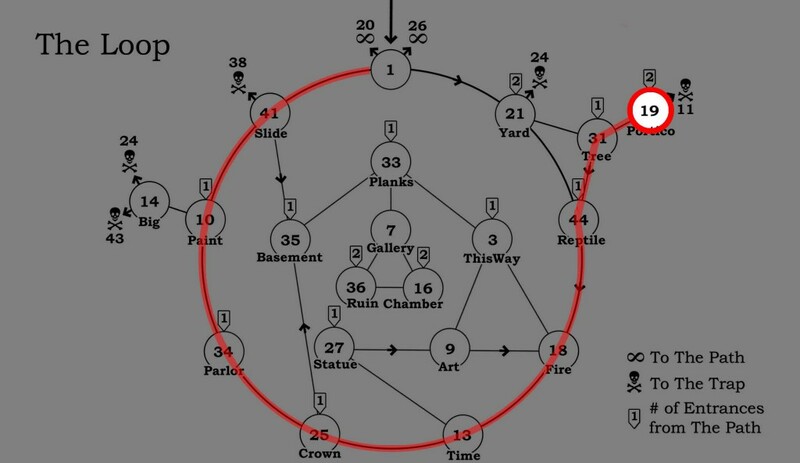 This gives us more help with 35 being a bird, since all the other “part”s turned up birds, and also helps us strengthen the connection from here to 36 that we should follow for the “riddle of the guide”. My older guess for the repeat “someone” in the text was – “Someone” is in the text twice and therefore is very probably a clue. Maybe it is as simple as “some one” where 3 = some and one = 1. “Some one” = “3 1”. Man’s hat points at heel of statue. An Achilles heel? Are these guys like alter egos of each other? A representation of the guide with sun in hand, and Manson at the easel? Is one trying to steer us false and the other true? Is Manson the guide’s Achilles heel? OK – look at back of easel. There is the back support, and then its extension to a leg. Then two more legs. 4 parts. One part is lit, and 3 are dark. 3,1 = 31. The color wheel and the brush make a seperate 31. Should we make anything of little guys hat pointing to big guys sun. I don’t think it point near enough to the sun to be meaningful. Actually, to build on David Gentile’s thought, what if we follow Manson’s paintbrush in the other direction–it does at least sort of point down to the legs of the easel. I don’t think this is a terrible solution: The statue of Sunman is the fake representation of Manson, bigger and muscular, Manson’s brush replaced by the massive staff which, as noted, has eleven points. Manson’s version of the staff, his paint brush, points to the legs of his easel: 3 points. We trust Manson over Sunman because of the text’s relating honesty with looking in the eye, as mentioned before. The brush could also be indicating the three formed by Manson’s body and palette, if that seems more compelling to you. “Get out of the way” could come from a ball player who hits the ball into 23. These rooms (23/17) do have the same time zone. (Thanks Abyssians). In 23 we learn that “pictures/pitch errors do not lie. That ball came from here in 19, and if the warning to get out of the way reflects another “pitch error” then we have another reason to trust the artist – pictures/art does not lie. It might in fact be better to group the paint brush with the 3 made by the arm and pallid and just take the 3 legs of the easel as reinforcement. Note that the big guys staff points down to the little guys brush. The brush of the little guy points at one of the bushes. It is possible that the hats relate to the bushes and that 3 are darker and one lighter, and this might be a clue. Now if you follow the shadows to try to figure out which bushes are more or less lit you don’t see a 3,1 grouping. But just LOOK at them, that first on is lighter. What is going on? We need to think about shading the way an artist would think about shading. We need to color part of an object lightest when light hitting it from a source would reflect to our eye, and that first bush is the only one in that position. The sun strikes the far right corner of the pot, and the bush and reflects to us. That is not true of bush 2 or 3, and bush 4 is too far away for the angle to be right for sun to reflect to us. Oh – a 3/1 ratio. OK. ???? But how does it help? Little guy is 1/3 the size of big guy. OK. But then would not little guy indicate 11 and big guy 31? Are you reading it as a red herring? No, because 11 is not 1/3 of 31. The idea is that the two of them together suggest a 3 and 1, or a 3:1 ratio. This does not fit in the with idea of one of them being a liar and one of them being a truth-teller; it has to do with, if anything else, the pair’s violation of the symmetry established in the rest of the room. The Sunman statue’s height seems to be three times that of Manson’s, or very very near it. I haven’t measured with a ruler; I just marked off Manson’s height with a slip of paper and saw how many repititions it took to reach the top of Sunman. I’d normally flush this kind of observation down the toilet, but the Sunman and Manson are clearly paired, and clearly contrasted; when Greg suggested their asymmetry may suggest an asymmetry in the correct door number, I thought it was an interesting proposal, but a bit too easy to apply to essentially every room in the Maze. But it seems this asymmetry is actually reasonably quantifiable, and we have one member of the pairing three times higher than the other. I’m not going to start a holy war to defend this, but I like it better than the easel/paintbrush solution. I’d note further that the use of conical hats could help to calibrate the heights, since it’s presumably easier to draw the characters to approximately the right heights and then use the hats for precision; it also makes it very easy to locate the precise apex of the figures. I agree. Asymmetry within a reflection seems more elegant a solution than counting the three legs on an easel and the paint brush on the wrong side of it as 31. There doesn’t seem to be a reason to reverse those objects and easels have three legs elsewhere in the Maze. If the easel had an atypical number of legs, I think it’d be more compelling. But wouldn’t little guy go with 11 then and big guy with 31? To clarify, again, the easel thing will be looking better to all of you when you solve another more difficult, more elegant riddle in this room. The measuring exactly from the foot to hat tip of the artist and aligning it to the statue from base to tip, it is an almost exact three to one ratio. This is how exact: when the statue was 600px tall, three artists equaled 602px. Check out Related Images. Adding it to the summary! Ok, if there’s more to the easel riddle then I’ll stop using that as an example of a puzzle solution so horrible it makes me want to hit things. BUT THIS BETTER BE GOOD. Thanks. The riddle itself is awesome. It will not necessarily make you love the easel thing but you should feel far more comfortable with it. We still don’t know what this riddle was, but I kind of look back with embarrassment on my skepticism here. Maybe it’s a lowering of standards, but I don’t think so; this just makes sense to me. The Sunman/Manson contrast seems to be a pretty clear focus here, the Sunman’s staff has 11 points…so far, so good. Now, Manson has to be associated with 31 somehow, and it’s probably not going to involve 31 of something jutting out of him, so we’re looking for a three and a one more likely…I mean, it looks good to me! I think a stronger tiebreaker between the two would be nice, especially since the Sunman has the advantage of light on his side, but the Manson 31 seems A-OK to me.